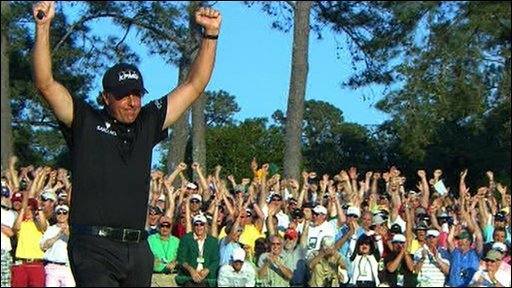 Phil Mickelson overhauled Lee Westwood to claim a third Masters Green Jacket after an enthralling final round at Augusta. The 39-year-old Mickelson produced some customary magic to pass third-round leader Westwood and dash the Englishman's hopes of winning a long-awaited first major title. 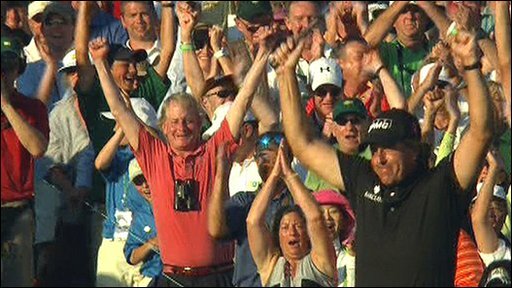 Mickelson fired a final-round 67 to end on 16 under, three shots clear of Westwood, to clinch a fourth major championship. Westwood carded a one-under 71 but could not quite match the brilliance of the American and has now finished second, third and third in his last three majors. Anthony Kim finished strongly, shooting a stunning 65 to finish third on his own at 12 under. Tiger Woods - the four-time Masters champion - was one stroke further back despite five months out following revelations about his private life. South Korea's KJ Choi, who held the joint-lead with Mickelson early on the back nine, also finished on 11 under after a 69 to share fourth with Woods. The 50-year-old Fred Couples, who was the champion in 1992, was a firm favourite with the Augusta crowd and came within two of the lead before finishing sixth on nine under. Mickelson, the 2004 and 2006 winner, was one shot adrift of Westwood at the beginning of the final round, but had moved to two in front after a birdie on the short 12th. He then fired a stunning second shot from behind a tree into the 13th green to set up an eagle chance. And, though he missed, he made a birdie to maintain a two-shot lead over Westwood, who also birdied, before racing three ahead at the 15th. The 36-year-old Westwood, who made three birdies and two bogeys to trail Mickelson by one at the turn, narrowed the gap to two with a birdie on 17 but could only par the 18th as Mickelson picked up another birdie to clinch the title in style. He joins Jimmy Demaret, Sam Snead, Nick Faldo and Gary Player on three Masters titles with only Tiger Woods and Arnold Palmer (four) and Jack Nicklaus (six) ahead of them. Mickelson has suffered an emotional year after the discovery that both his mother and wife Amy had contracted breast cancer, and he hailed the win as "one of the best things we've gone through". 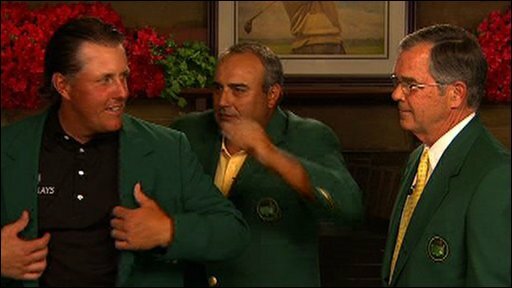 "To come out the other end and feel the jubilation is incredible," said Mickelson, who also won the USPGA title in 2005. Afterwards Mickelson admitted he did not know whether his wife was going to make it to the course as she was struggling with low energy because of the medication she is taking to fight the disease. "To walk off the green and see her was very emotional for us," he added. "It's been a difficult year, and to come out on top in this tournament is very emotional." Mickelson admitted the last three holes were anything but comfortable, despite holding a three-shot lead. He had earlier seen compatriot Kim mount a stunning challenge by picking up five shots on the back nine, including an eagle at the 15th to surge into the top three, while Woods, who began four shots behind, lost three strokes in the first five holes. Woods holed his second for an eagle on the seventh and climbed back to nine under at the turn before a topsy-turvy back nine, which included two bogeys, two birdies and an eagle, took him to 11 under. "I entered this event to win and I didn't get that done," said a disappointed Woods. "I finished fourth. It's not what I wanted. I wanted to win and as this week went on I played worse. "After Friday it wasn't very good. I didn't hit it well enough and made too many mistakes around the green. I'm going to take a little time off and evaluate where I go from here." American Nick Watney also fired 65 to climb to eight under, with compatriot Hunter Mahan and South Korea's USPGA champion YE Yang seven under. Ian Poulter was unable to bounce back after losing ground on Saturday and the Englishman finished five under after a closing 73. "I'm frustrated," he said. "Yesterday I didn't hit it at all well off the tee and got myself into trouble. I played pretty well today. It's a game of fractions around this golf course. Tenth - I'm not overly satisfied." Tom Watson, the 60-year-old two-time Masters champion, followed up his second-placed finish at the Open last year with a tie for 18th at one under alongside defending champion Angel Cabrera of Argentina.